The Albany-Colonie Diamond-Dogs moved on to the league finals in September 1998 and their closer Sandi Santiago helped get them there, according to The Schenectady Daily Gazette. After a couple hits and a couple errors, Santiago stayed focused and recorded the final out on strikes, The Daily Gazette wrote. "It's a good thing Sandi was as good as he was," Albany-Colonie manager Charlie Sullivan told The Daily Gazette. "If he walks a guy or two between those errors, we're still playing." Santiago still played in 1998, after a career that spanned seven previous seasons and seen him previously only make high-A. That year in independent ball also marked his last as a pro. Santiago's career began in 1990, signed by the Yankees as a free agent out of his native Dominican Republic. He started with the Yankees in the rookie Gulf Coast League. The relief pitcher got into 23 games, saved four and ended with an ERA of 1.82. 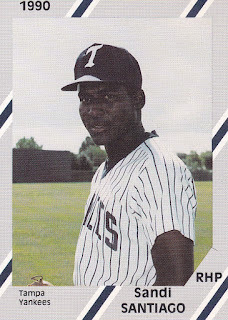 Santiago played 1991 between short-season Oneonta and the GCL, but saw only nine outings between them. He pitched all of 1992 at Oneonta, 23 appearances. He ended with a 5.18 ERA. He also got into a photo that later made a Florida art exhibition. He played 1993 largely at single-A Greensboro. He gave up a double in a May game. He it high-A San Bernardino in 1994 and got ejected in an April contest. He then played his final two seasons in the Yankees system in 1995 and 1996 at high-A Tampa. After not being recorded as playing in 1997, he returned in 1998 with independent Albany-Colonie. He got into 20 games, saved nine and had a 4.79 ERA to end his career.